A crack private eye for her client cases, Sam’s been tormented by her own cold-case mystery―the elusive identity of her attacker. When Sam receives a shocking letter and an unexpected windfall, she teams up with Allison, her witch BFF, to check out a spooky estate. What she discovers there sends her hurtling down a path toward the unmasking of her vampire sire―he who turned her, twelve years ago. But the facts of a cold case are not always black or white. In shades of gray that astound her, Sam peels back the layers of her past, a past that goes back further than she ever imagined. On Sam’s journey to the deepest levels of self, something wicked lies in wait to threaten the future. As evil manifests into flesh and rises up, she’ll have to keep her friends close and her sword…closer. Will Sam’s quest for the truth descend into a ferocious battle with the world’s most deadly creature? 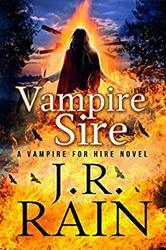 VAMPIRE SIRE, Red Rider, Part 1, is the first book of an epic two-part paranormal mystery adventure set within the Vampire for Hire series.